If you follow me on Facebook, you might have spotted my rant a few days ago about some misconceptions about business networking. Basically, someone had expressed disappointment that they had been to a networking event, once, and “hadn’t got anything out of it”. I think this is a really common, and really understandable misconception about networking, not least because people often start networking because they want to make extra sales. The organisers of networking events though, don’t have a queue of people waiting to buy your stuff. The organisers of networking events provide a platform, and it’s up to you how you use that platform. And this is where the effort comes in, because I believe, and my experience has been, that people really appreciate effort and want to pay it back. One of the most common concepts which is talked about in business networking is that of Meet-Like-Know-Trust. That process whereby someone goes from meeting you for the first time, to trusting you enough to want to do business with you, if the time is right for them and they need or want your services. (If you want to read more about why timing is SO important, take a look at another article I wrote here – Why the right time is as important as the right place). I believe that the Meet-Like-Know-Trust process can be accelerated if you apply the right sort of effort. If you want to meet more people, get along to more networking events. 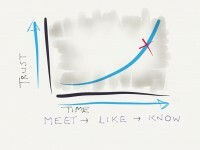 If you want to get to know people better, spend more time getting to know them. Talk to them, engage with them on social media, don’t just broadcast – actually go one to one with as many of your social connections as you can. If you want to start to be known as the authority in what you do, turn up more often than other people in the same field and be generous with your time and expertise. Networking gives you a huge opportunity to demonstrate your expertise WITHOUT giving away free consultancy. If you want to get a reputation as a public speaker, deliver the 4Sight at 4Networking events and volunteer to speak at as many other business events as you can. A lot of the time the events will already have their speakers organised. It’s down to you to persevere here. My best advice is to turn up to the events and get to know the organisers even if you aren’t speaking. Put the legwork in. Some of my early speaking gigs came from being there when a speaker cancelled at very short notice. At first, or at any point when you are growing your business, it is down to you to put the effort in to go to the people. It isn’t their job to come to you. If you are choosing to do that through networking and social media, then it is going to involve some early mornings and a lot of time replying to people on social. And finally, something else which the effort will accelerate is your education. How to best engage at networking meetings, how to deliver a killer 4Sight or seminar, how to follow up. The more you do it, the better you will become at it, as long as you listen to the feedback (which might sometimes be silent feedback). 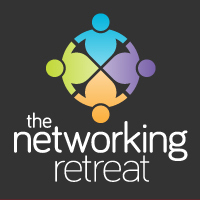 Want huge results from networking? Put in the effort and apply yourself to it. Don’t just turn up and be disappointed that there weren’t people waiting to buy.